Pisamonas is a family company, founded in 2013 by two married couples. When we couldn’t find shoes on the Spanish market that ticked all the boxes that we considered vital for our little ones (quality products, with careful designs, easy to find and at great prices) we decided to start our own firm. Five years later, Pisamonas is today, one of the leading Spanish brands in the sector, with a big national presence as well as an international one, operating in countries like France, the UK, Italy, China and Portugal. As one of the leading online children’s shoe stores, we’re your one-stop shop when you need to buy your kids, friends or relations shoes and accessories for all tastes and styles, made in Spain, and want to get unbeatable value for money. At Pisamonas, we offer you your old favourites, like you've never seen them before. Classic products that never go out of fashion, like Menorcan sandals, boat shoes, moccasins, Oxfords or desert boots, in a wide variety of sizes, colours and materials. But, as one of our main aims is to marry together past, present and future, we also have a huge selection of super up-to-date models which suit today’s tastes and needs so that your whole family can enjoy the latest trends with all the quality of traditional Spanish footwear. Thanks to our innovative business model, with a strong internet presence and a physical expansion plan which means we’ve got more and more physical stores opening around Spain, at Pisamonas we’ve got the shoes you're looking for at the price you want to pay. And all of that with the ease of being able to buy any of our products through our two sales channels, both online and offline. 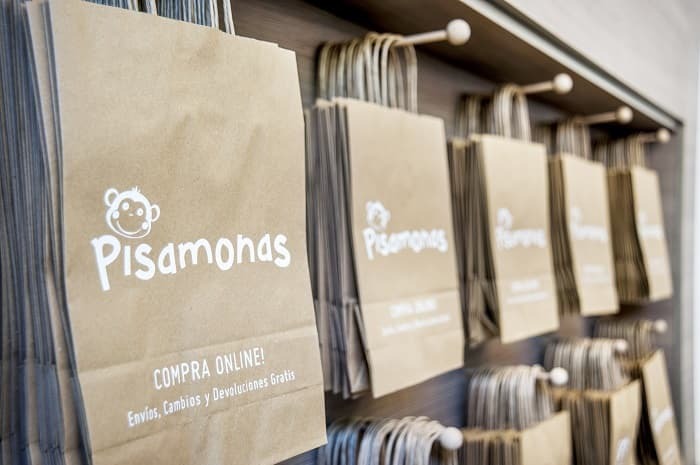 At Pisamonas we want to make your day to day life easy, which is why all our products are available on our website or at any of our points of sale. You can combine the two ways of purchasing however suits you best. At Pisamonas we’ve always relied on 100% Spanish production, encouraging local employment and supporting the traditional Spanish footwear industry. That’s why all of our products are made nationally and offer exceptional quality, comfort, practicality and design, the four pillars which our company is built on. We work side by side with the best artisans, factories and providers in the industry, taking advantage of the latest technology to blend the current needs of our children with the deep-rooted traditions of shoe-making. At Pisamonas we believe that there’s no one better than us, parents of large families with daily lives just like yours, to offer you and your children just what we want for ours. We’re a trustworthy footwear firm that offers quality, good service and exceptional client treatment so that you find what you're looking for without wasting time or money, so that you can dedicate your free time to what really matters: spending quality time with your loved ones, whilst clad in Pisamonas!